This is a nice easy walk over the hill to the south of Darlington. From the top of the hill, you can see these cliffs at the far end of Hopground Beach. When you get down to Counsell Creek, with the new bridge, you can either head along the beach or continue along the road. If using the road, there are some steps at the far end of the beach taking you down to the start of the cliffs. These cliffs are best visited when the tide is low, and I think if you went at high tide, you would have a greater chance of getting damp as you clamber around the cliffs. You need to go around the first and second little points, and make your way along in front of the taller part of the cliffs. 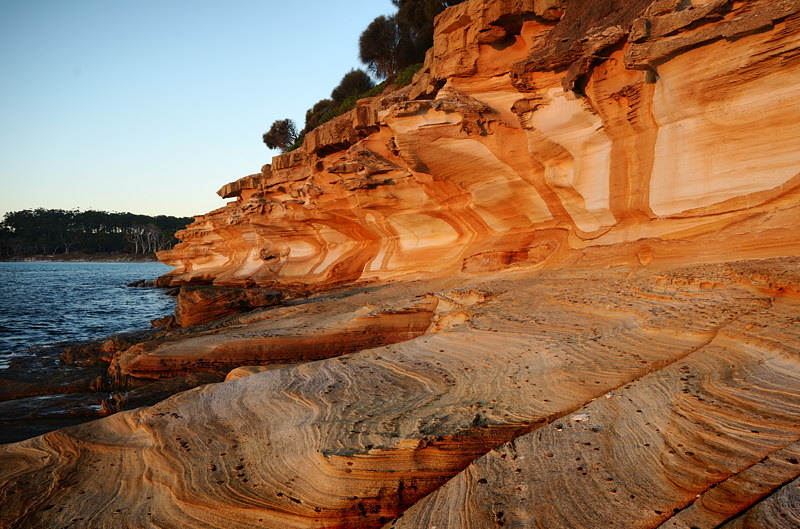 The cliffs are Triassic sandstone, the rich patterns caused by minerals in the rock and the way in hich they have subsequently weathered. I visited them a couple of times on my recent trip, once at sunset, which was very attractive.